How can I reuse or copy last year's invitation? Locate the invitation on your Invitation Dashboard and find Copy button. To copy a past invitation in the mobile app, click on My Invites and then tap on the Past tab. Locate the invitation you would like to duplicate and click on it. Next, tap on the three dots in the upper righthand corner and select Copy Event. From there, as with copying an invitation on the web, you can change whatever you like on the new invitation if you want to tweak anything. Don't see the copy button? This indicates the event was planned in a different account. Email Us and we can help you locate the correct account. 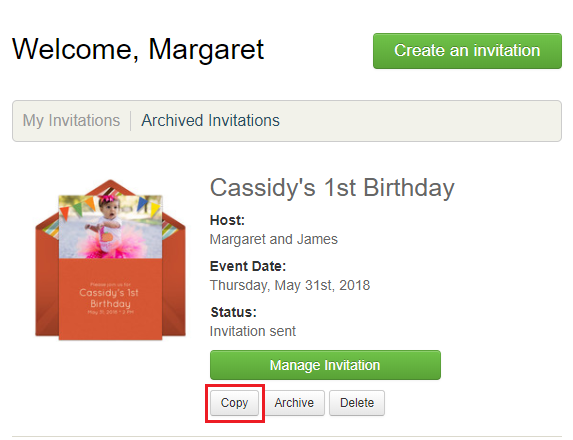 After you select "Copy" we'll ask you a few questions and re-create a new invitation.